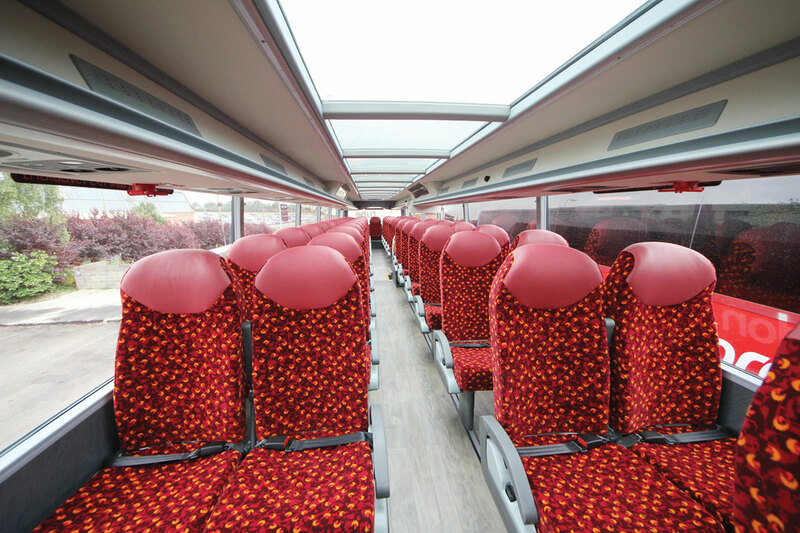 Stagecoach’s Oxford Tube service has announced more details of a fleet of 26 specially designed Van Hool Astromega double deck coaches. The £10m worth of new vehicles represents the largest ever investment in new coaches for the Oxford to London route. Each of the new fleet has a glass roof, increased legroom in the majority of seats, as well as high-speed 4G wi-fi. In addition, a new larger luggage rack has been fitted to the lower deck area to enable passengers to bring on board larger carry-on items. A new automated audio-visual passenger communication system has also been fitted. The new coaches will have Euro6 engines that run on B30 fuel, a mix of 30% biofuel and 70% standard diesel. On 16 July, the first of the 26 new coaches will go into service. This will be shortly followed by the remainder of the coaches. To mark the arrival of the first of the fleet of coaches, Stagecoach has launched a Twitter competition involving a specially commissioned biplane that travelled through the skies above Oxford trailing a promotional message.